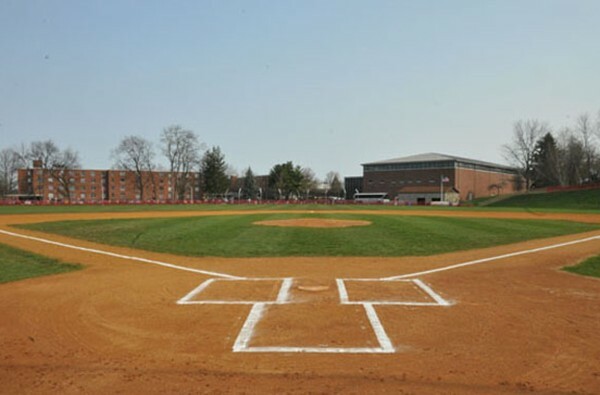 Mitterling Field is the home of ESU’s baseball team. When a team loses key players that were vital to championship runs and record setters in the program, it sometimes requires a period where the team takes a few steps back before they move forward again. Don’t tell that to the East Stroudsburg University baseball team. Despite losing one of their most successful senior classes in recent years, the Warriors are off to a respectable start for the 2015 campaign. As the baseball diamonds in Northeast Pennsylvania begin to thaw, the Warriors have yet to play a game at Mitterling Field. They headed to North Carolina in mid-February to face non-conference opponents and wasted no time establishing a winning mentality. ESU won nine of its first ten games, which included a record-setting 29-1 win over Felician on February 14 and a no-hitter thrown by sophomore Ian Allen against Virginia State on March 8. In the lone loss coming against Virginia State, the Warriors stranded the game-tying run in scoring position base to end the game. Throughout the road-trip, the Warriors’ offensive prowess was on display, outscoring their opponents 96-30 and scoring double-digit runs in five of the ten games. When it came time for the commencement of conference play, the Warriors were forced again to go down south, this time to Maryland. ESU opened up their conference play with defending Pennsylvania State Athletic Conference champion Kutztown University in a four-game, two-day series. ESU extended their modest three-game winning streak to four with an 11-1 victory in the first game of the series before having it snapped in the nightcap, getting shutout 10-0. The back-end of the series included a pair of wins by the scores of 11-6 and 6-5 to secure the series win for the Warriors. Newly added junior first baseman, Dylan Tamecki, flourished in the 6-5 game, driving in all five of the Warriors runs and hitting a grand slam and a go-ahead solo shot in the top of the sixth to give ESU the lead. Sophomore closer, Tyler Eckman, shut the door on the Golden Bears, earning his seventh save of the season, and allowing ESU to tie its single-season record in just 14 games. Sophomore third baseman, Jay Young, highlighted the offensive attack hitting .412 (7-for-17) with three doubles, a triple, a home run, and drove in five RBI out of the leadoff spot in the lineup. After their first conference series win, the Warriors moved on to another tough PSAC East foe: Millersville University. The Warriors were on the short end of the series, earning just one win in the four-game series. The win came by the score of 11-5 in the second game of the series. Young continued to be a threat at the plate, posting a .444 average (5-for-9) and leading ESU’s averages with a composite .453 average, along with 18 RBI in the first 16 games of the season. The Warriors are back on the diamond this afternoon with a scheduled double header at home against Shippensburg. The games are scheduled for 1:00 PM and 3:00 PM.